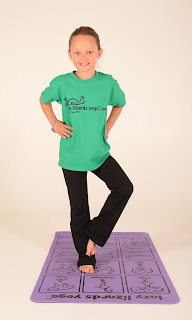 I teach both kids and adults yoga. Some days it’s harder to transition from class to class, just like every day is different on your yoga mat. One day a week a teach 2 kids classes, then move on to teaching an adult class, back to a kids class, then an afternoon wellness class for the workplace. This day is both very busy and very rewarding at the same time. Last week while transitioning from my adult class to my kids yoga class, I made a huge mistake with my words. Teaching children ages 3 to 5, is very different then teaching a classroom of adults. My adult class theme was about “grounding” and I went to my kids class and used the word “grounded”. As soon as I said it, I knew I had used the wrong word. I looked around the class, and watched the face of a 5 year old girl go from a huge smile to a worried face. I immediately stopped and asked the girl, “What’s wrong?” She replied, “I don’t like being grounded, I feel like I am always grounded and have to stay in my room.” I smiled and told her not to worry, that nobody was in trouble, and that “grounding” in yoga is different then being “grounded” at home. Then all the kids of course talked about how they are “grounded” at home. After all the children shared, I went back to talking about being “grounded” in yoga: feeling your feet being strong in the mat, being proud of who you are, being strong from the inside out, knowing you are the best person you can be. After class, the 5 year old girl came up to me and gave me a huge hug and said, “Thank you for making me feel good from the inside out.” I responded with a huge smile and a big hug back. I will not use the word “grounded” in my kids yoga class again, but all in all the the day was a great learning experience for both me and my yoga kids.